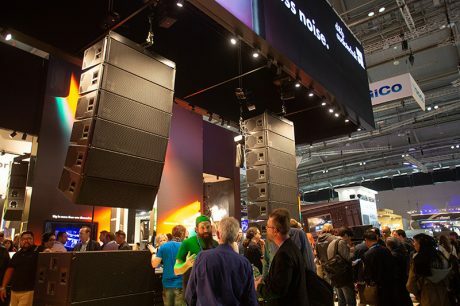 FRANKFURT, Germany – Messe Frankfurt, the organizers for the Prolight+Sound and Musikmesse events held this year from April 10-13 and April 11-14, respectively, announced that the two events will “overlap fully” in 2019, with both open from April 2-5. They will also be staged in closer proximity next year. The next Musikmesse Festival, meanwhile, is set for April 2-6, 2019. The scheduling change, which reverts back to previous years when both shows were in synch, promises to optimize the “synergistic effects” of having Prolight+Sound, a pro lighting, video and audio event, co-located with the MI-focused Musikmesse event, according to Messe Frankfurt board member Detlef Braun. Along with separate show dates and locations, exhibitors and attendees needed to contend with public transport strikes and close to 800 flight cancellations for the 2018 event. Despite a decline in the numbers of non-pro visitors from Germany, Messe Frankfurt found encouragement in a 10 percent growth in share from trade visitors (up 10 percent) and a 7 percent gain in their tally of exhibitor satisfaction. Combined, the events in Frankfurt drew 1,803 companies from 56 countries who presented products and services to more than 90,000 visitors from 152 countries around the world. For more information on the products offered in 2018, CLICK HERE. FRONT of HOUSE will be posting more news from Frankfurt in the coming weeks along with a report on the show in the May issue. Don’t miss it!